1. Our premium quality tea products are packed fresh in foil packages and shipped worldwide directly from Shizuoka, Japan. They are never blended with cheaper, inferior-quality teas from other countries and re-packaged as the "look-alike" Japanese green teas that often appear on store shelves. You and your customers will taste the difference. 2. 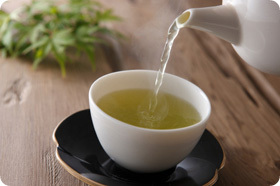 We are specialists at customer-direct delivery of premium quality Japanese green loose leaf teas, Matcha tea powders and tea bags sourced at the center of the Japanese tea industry in Shizuoka, Japan. If your current supplier handles a multitude of teas from various countries and makes one worldwide buying trip per year, then you may not be receiving the freshest, best quality Japanese tea at competitive prices. 3. Our year-around-staffed buying office located in Shizuoka, Japan, has direct access to the over 38,000 tea farmers, 3000 tea processors and 500 finished tea packagers located in Shizuoka Prefecture and throughout Japan. All are ready and eager to supply the finest Japanese tea available, and all are carefully screened by our office. 4. Our major suppliers are ISO Certified. Learn about ISO Certification (outside link) and find out why compliance with ISO standards is very important at a time when there is concern for food safety. 5. The flat business model of ShizuokaTea.com allows us to respond quickly to changing market conditions and new products. It also permits us to offer our products at very competitive prices. 6. The successfully operated ShizuokaTea.com online retail store provides us the opportunity to observe and detail consumer preferences first hand. This helps us guide those who seek assistance in selecting the right teas for their retail customers. 7. Our superior-quality attractively packaged consumer products are excellent choices for numerous industries, including retail, hotel and accommodation, restaurant, airline, gift basket, corporate gift giving, fund-raising, promotional items and health-care. Wholesale pricing and orders from ShizuokaTea.com are available to any business or individual who wishes to purchase the minimum wholesale order size of our loose leaf teas, Matcha, green tea powders and tea bags. Please fill out the Wholesale Price Request Form below. We will send you the Product/Price Information you requested by e-mail attachment shortly thereafter. Let us know your questions or requests. We will answer your questions, provide a price quotation and help you decide on your product selection, order quantity, shipping method and payment options. Your order will be shipped directly to you from Japan or the USA. Please Fill Out The Form Below To Request Wholesale Pricing You Do Not Need To Create An Account. Select Those Products Below For Which You Are Requesting A Wholesale Price Quotation. Then click the SUBMIT button at bottom of page. Select from these popular-selling products if you desire to place a small minimum order that will be shipped immediately from the USA. Please view our Shop Here-Bulk Loose Leaf Teas Page for product descriptions. Carton orders may be of mixed varieties. All package sizes are 500 grams except Houjicha (200 grams). Choose from our large selection of Standard, Certified Organic (JAS-Japan, USDA), EU Certified and Specialty bulk-packaged loose leaf teas shipped directly to you from Shizuoka, Japan immediately after packing. Both small and large (container) order fulfillment is available. Minimum order quantities apply. Matcha: Our Matcha products are shipped directly to you from Shizuoka, Japan immediately after being packaged fresh. This is very important for this relatively short (six months) shelf-life product. If Matcha is shipped from a location outside of Japan, then there is a good chance it is not as fresh and excellent-quality as it should be. We offer a variety of Matcha products in three quality categories of use: Food/Beverage, Consumer and Tea Ceremony. Green Tea Powders: The popular-selling green tea powders sold on our web site are available in bulk packages, plus several of these products are offered in the same consumer-packages that we use. Please view these products on this page Shop Here-Green Tea Powders. Semi-Custom Private-Brand Packaging: We successfully use both Japanese language and plain foil packages for our own consumer product packaging. Numerous examples can be viewed at our Shop Here page. The minimum order depends on each variety of loose leaf tea or tea powder. Simple label or package-direct printing is possible or you can apply your own label after packaging. Tea bags are often packed into re-sealable foil packages without the use of an individual foil or paper wrapping. The minimum order depends on the variety and amount of tea used. Completely-Custom Private-Brand Packaging: Almost every one of the many loose leaf tea, tea powder and tea bag products we offer can be packed in your completely custom private-brand package in Japan and shipped directly to you. Please be advised that the minimum package-printing quantity is rather sizeable and that the lead time from artwork preparation to final delivery may be up to three months. Re-sellers and gift-givers can order our attractively packaged best-selling English-language tea bags in small minimum quantities for immediate shipment from the USA or Japan. Tea bag boxes are UPC bar coded. The ShizuokaTea.com contact information does not appear on any of the packaging and there is space for your label. Our tea bags are available with or without the box. The minimum order is one carton of 600 tea bags shipped immediately from the USA. Large orders shipped from Japan are available in two different qualities of tea bags at reduced prices. They are "Consumer Quality" (the same exact tea used in our own products) and "Business-Use Quality" (a slightly lower grade of tea at a lower price). Please view our Shop Here-Tea Bags page for product descriptions. Please add your comments or questions in the box below. We will send you the Wholesale Price Lists you requested shortly. Please click only once. It may take a minute or two, depending on your server speed. Once your pricing request has been received, we will send you a return e-mail with our wholesale prices. Then please inform us which products you wish to order and we will arrange payment via our online shopping cart or another payment method. Please refer to our Store Help Page for details about our wholesale order policies and payment options.